A baby who is compromised in labor or during delivery is in distress. This is usually determined by evaluation of the fetal heart rate in labor using some form of fetal monitoring. Fetal distress may also be suspected if there is meconium, fetal stool, in the amniotic fluid. Reasons for fetal distress are varied from cord issues to fetal anomalies, reactions to medications or the stress of labor, and other complications of labor. When you are in labor, your baby is monitored. Your baby can be monitored in many ways, but the most common way is to use an electronic fetal monitor (EFM). The fetal monitor uses two straps that go around your abdomen. One measures the baby's heart rate, and the other measures your contractions or uterine activity. Using the graphs of the heart rate, your doctors or midwives are looking to see if the heart rate stays within certain parameters. Too high may indicate that your baby has a fever or is in distress. Too low may mean that there is oxygen deprivation due to a number of reasons, including a position, the cord is becoming compressed, etc. The monitors will also be used to tell when your baby is experiencing distress, in relation to each contraction. Examples might be throughout the contraction, recovering in the break periods, only at the end of the contraction, or both during and after contractions. Each timing may mean something slightly different and may call for a variety of attempts to fix the issue. Be sure to ask questions about what is going on and what your options are when possible. While the word fetal distress calls to mind extreme emergencies, there are many times where you do have time to ask questions, even as plans are being made to move forward with corrective techniques. If you have had a cesarean for fetal distress or experienced fetal distress in a previous birth, that doesn't mean that you will be likely to see it again in a future pregnancy. Talk to your practitioner and look at your birth records to see if a cause was found. This may help alleviate your fears for future births. Some mothers wonder how fetal distress is found with intermittent fetal monitoring, the standard for a low-risk mother. The truth is that when you are on the monitor, the nurses and staff are looking for telltale signs of fetal distress. Typically, distress in a baby is not something that comes out of the blue but rather builds. When these early signs are present, the staff will ask that you remain on the monitor, switching from intermittent monitoring to continuous fetal monitoring. This allows the team to watch your baby more closely. American Congress of Obstetricians and Gynecologists. (2009). “ACOG Practice Bulletin No. 106: Intrapartum fetal heart rate monitoring: nomenclature, interpretation, and general management principles.” Obstetrics and gynecology 114(1): 192-202. Alfirevic, Z., D. Devane, et al. (2006). 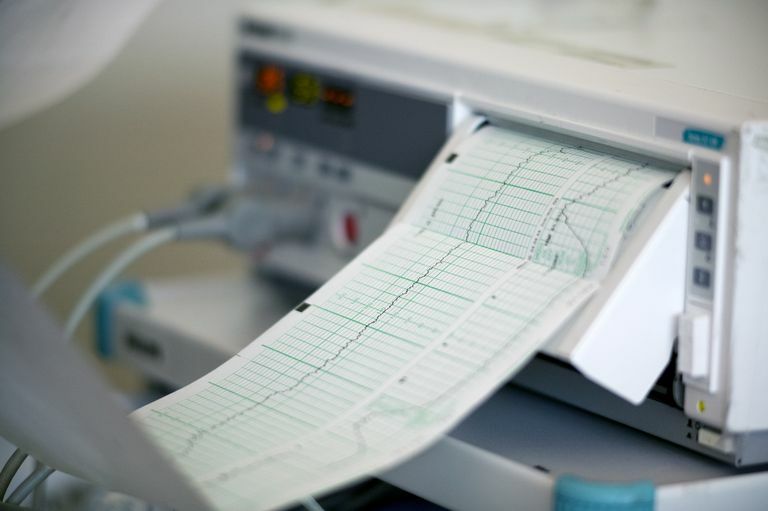 “Continuous cardiotocography (CTG) as a form of electronic fetal monitoring (EFM) for fetal assessment during labour.” Cochrane database of systematic reviews(3): CD006066. Bailey, R. E. (2009). “Intrapartum fetal monitoring.” Am Fam Physician 80(12): 1388-1396. Herbst, A. and I. Ingemarsson (1994). “Intermittent versus continuous electronic monitoring in labour: a randomised study.” Br J Obstet Gynaecol 101(8): 663-668. Nelson, K. B., J. M. Dambrosia, et al. (1996). “Uncertain value of electronic fetal monitoring in predicting cerebral palsy.” N Engl J Med 334(10): 613-618. Can I Use Laughing Gas for Labor? Late-Stage Pregnancy: What Is a Non-Stress Test?